At the kick-off for the World Cup finals on 14 June, Russia will move to the public limelight for four weeks. 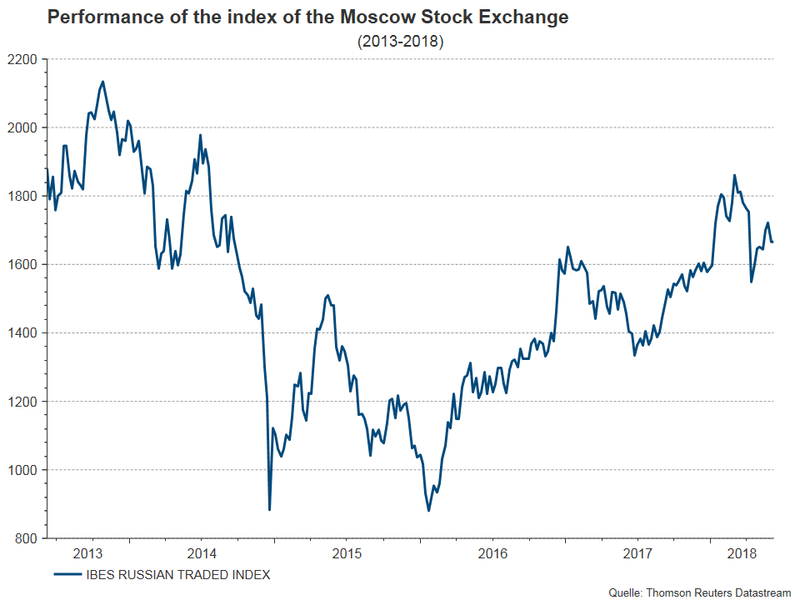 There are numerous reasons for a closer look at Russia, its economy and its equity market beyond the current events in sports: the recovery of the oil price, the renewed tightening of sanctions, and the re-election of President Putin as well as the rise in US interest rates and the recent strength of the US dollar have shifted the economic backdrop and the framework for investors. The Russian economy has moved past the recession of 2015/2016, which had been largely triggered by a slump in oil prices and the related drop in domestic purchase power. This year and in 2019, the economy should grow by about 1.8% according to current forecasts. Whereas a number of emerging economies have been negatively affected by the rise in US interest rates and the appreciation of the US dollar, Russia is in a better shape dealing with these challenges. The country has been running a current account surplus and its fiscal budget is broadly balanced. Total debt has generally fallen over the past years, with government debt amounting to only 17.5% of GDP. However, the solid macroeconomic figures should not gloss over the fact that the long-term growth momentum of the Russian economy is subdued. Current growth projections imply that the Russian economy will be growing only at half the speed of the global economy – in stark contrast to the years prior to the financial crisis, when the country was in the fast lane. Whether this will change during “Putin 4.0” remains to be seen. The new government and the reform goals as expressed in the president “May decrees” are signalling limited willingness to reform. There are no signs of loosening sanctions by the West. In fact, the opposite is the case: the USA has imposed new sanctions, which among other things have led to another bout of depreciation of the Russian currency. So far, the negative effects of the sanctions have been partially absorbed by the fluctuations of the price of oil and other commodities, but in the long run the sanctions’ impact will be clearly negative for the Russian economy. From an investor’s perspective, the last round of US sanctions is particularly negative given that for the first time listed companies and their international operations have been targeted. Note: Past performance is not indicative of future development. This situation notwithstanding, the overall outlook of Erste AM for the Russian equity market is positive. At a PE of about 6x based on forward looking earnings, the market commands an attractive valuation. The valuation discount relative to other emerging markets is clearly above 40%. Also, the Russian equity market offers a dividend yield of more than 6%, which is bolstered by both earnings forecasts and foreseeable dividend policy. At the moment, we prefer export-oriented companies with healthy balance sheets that can maintain profit growth also in a difficult environment. These are mainly listed companies in the energy and commodity sector that benefit from the weak rouble and offer investors a high dividend yield. Due to the composition of its portfolio, ESPA STOCK RUSSIA may be subject to elevated volatility, which means that the shares of the fund may experience significant fluctuations within short periods of time. ESPA STOCK RUSSIA may invest significantly in derivative instruments (including swaps and other OTC derivatives) as defined by sec 73 of the Austrian Investment Fund Act of 2011. Peter Szopo has worked as chief equity strategist at the Erste Asset Management since March 2015. Before he already worked as a consultant for equity fund management at Erste Asset Management for Central and Eastern European equity markets. From November 2009 to April 2013, he was head of the research department at Alfa Bank in Moscow. After his research work at WIFO (Austrian Institute of Economic Research) from 1978 to 1990, he worked as a securities specialist in various management functions at internationally renowned investment banks. During this time he held the position of Head of Research at such institutions as Creditanstalt Investmentbank, UniCredit Bank Austria, Robert Fleming Securities, and at Bank Sal. Oppenheim. Along with his analysis activities, he worked from 1997 to 2000 at Eastfund Management as the fund manager for Central and Eastern European equity. European shares – is it still time to get in on this one, or has the ship sailed? Which factors drive equity markets?